Hello and welcome to issue 80, the Soapbox Science issue. May is always my favourite time of year because of the long days and promise of summer to come, and it now has strong associations with Soapbox Science for me. There’s a strong element of serendipity with Soapbox Science. As the sessions are held in busy thoroughfares in cities, the people who come into contact with the science weren’t necessarily planning to. Stumbling upon the experience is a happy accident. Fancy some science as you shop or stroll? In Brighton, this year the it’s science by the sea. Essentially, it’s anywhere there’s people. Of course, some people are Soapbox stalwarts and they plan to attend. 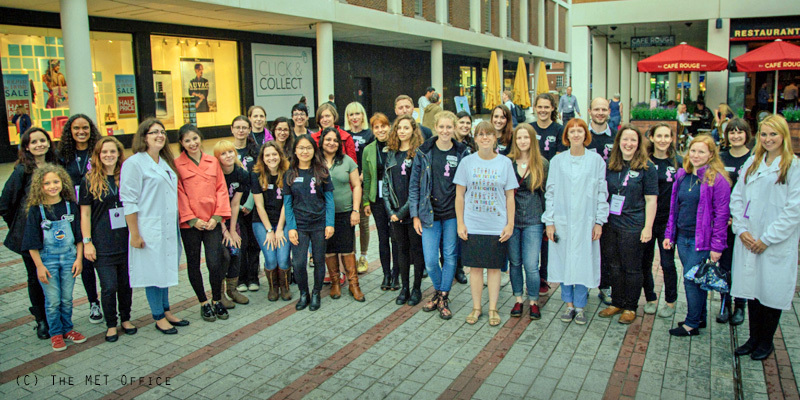 The other thing I love about Soapbox Science is that it’s not just aimed at girls either. The idea is to demonstrate to future generations and hopefully some of our own too, regardless of gender, that science is for everybody. It’s inclusive. It’s women on the Soapboxes but there’s mixed teams working together behind the scenes. Simplicity is another Soapbox Science strength. They say the simple ideas are the best. They say, or rather, Einstein says: “If you can’t explain it simply you don’t understand it well enough.” It’s absolutely true. Can you imagine in any other career, other than perhaps entertainment, having to get up and talk with confidence about what you do in such a public space? You’re literally standing on a box and telling people about your job. So, let’s hope you know what you’re talking about. At least if you’re on a stand-up stage or in the theatre it’s a bit harder (although granted, not impossible) for people to walk off. Not so in the street. If people are bored they don’t hang around. So, these women need to be fearless and ready for anything. Fortunately, as Soapbox Science has been going since 2011, so hopefully there aren’t too many things the organisers aren’t prepared for. Or maybe it’s the public who should beware. I love the text on the Soapbox Science website that says: “Look out for bat simulators, fake breasts or giant pictures of volcanoes.” You – have – been -warned. What better way to help get a complex idea across than to use a little help from your friends? For the first time this year, several Soapbox Science events are a science and art mash-up. What better way to help with engagement that to dazzle the senses? What’s more exciting and amazing than science? Why science and art mixed together, of course. 5. If an idea’s great, why not pass it on? 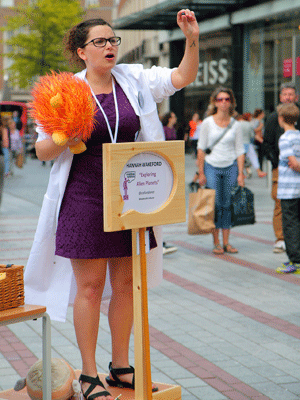 For the first time ever this year, Soapbox Science is heading for Canada – Toronto to be precise. After its international debut in Australia last year it’s also back there but it’s taking on another continent. Is it just a matter of time before Soapbox takes over the whole world? I do hope so. After all, the simple ideas are the best.